The back of the box lays it all out; your cannon tilts and swivels to line up an enemy in the mini-periscope mirror and the missile does the rest. The game comes with a 24″ x 15″ map (below) with strategic positions for your targets in Galman and Bolar territory. The directions offer three variations on the game in which you fire only from specific vectors using a cardboard strip (included) to line up your shots. 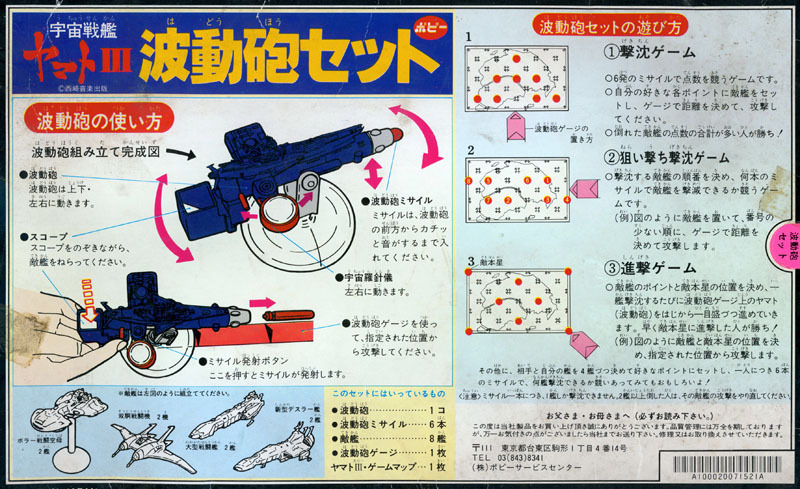 Here is your prime weapon, which neither resembles nor works like Yamato‘s mighty Wave-Motion Gun. The fact that it shoots missiles arouses the suspicion that it was created for another game entirely, then just repurposed for this one. The rubber Yamato fits onto the large peg on top, just in case you need a reminder of which game you’re playing. With the space map as your surface, you line up your shot using the cardboard strip. The Bolar craft waits at the end of it, taunting and teasing you until you can’t take it anymore. Look at it sitting there, all green and rubbery, acting like it owns the place. That sucker’s just begging for a beatdown. Inserting the frighteningly huge red missile into the cannon, you line up your enemy in the mini-periscope in the back. The compass, incidentally, is completely useless. Push the red pin behind the compass (hopefully without pushing the entire cannon over), and BAM! Another Bolar barbeque. Now it’s on to the next target until the galaxy is safe for pure-hearted rubber spaceships once again. This entry was posted in Merchandising (Series 3) by TimEldred. Bookmark the permalink.